Everyone knows wisdom teeth are an irritating rite of passage. I was expecting them to be painful when they started coming through, but only found out recently just how serious a health issue they could be. Last year, aged 27, I found myself grinding my teeth at night due to stress. This was causing mild pain on both sides of my jaw, and I could feel a clicking sensation when chewing. I went to the dentist and was referred to consultant oral and maxillofacial surgeon Katherine George at London Bridge Hospital. She diagnosed a minor joint dysfunction in my jaw and recommended a soft diet, a mouth guard and painkillers. After that, the condition improved very quickly. However, when Miss George, who is also based at King’s College Hospital NHS Foundation Trust, later took an X-ray of my jaw, she discovered a cyst the size of an apricot on the right-hand side. I’d had no idea it was there. It was painless and entirely unrelated to the symptoms I’d seen the dentist about. The cyst had been growing, slowly and silently, for about three years. As a result, my jaw was very weak — so weak that taking a large bite of a crusty baguette could have caused it to fracture. If it wasn’t operated on, the cyst would continue to grow, ‘dissolving’ my jaw bone and making it weaker until it finally broke. The cyst, a fluid-filled sac lined with soft tissue, was caused by a healthy wisdom tooth buried in my lower jaw. Attached to the crown of the buried tooth (but still within the jawbone, below the gum), this cyst was expanding like a balloon. Around 2 per cent of wisdom teeth are taken out because they have formed a cyst. Most, like mine, grow from the soft tissue surrounding the buried tooth. Outwardly, there is nothing to be seen: the cyst dissolves the bone rather than expanding outwards. ‘Any kind of long-term pressure on the jaw will cause the bone to dissolve — known as resorption,’ says Miss George. Wisdom teeth are our third molars, used for chewing and grinding. They erupt, or emerge, when we are about 18. By this time, our 28 other adult teeth are already in place, which means there isn’t always enough room in our mouths for them. Vinod Patel, consultant oral surgeon at Guy’s and St Thomas’ Hospital in London, says this means that the majority of us have impacted wisdom teeth — teeth that only partially emerge, or emerge at an angle. ‘Our jaws have become smaller over thousands of years, because our diets have become softer,’ he explains. ‘Wisdom teeth are the last molars to come through and there is often no space. This often leads to decay in the tooth and, if they are touching, the one next to it, too. Other consequences include gum disease, and sometimes a cyst can form. 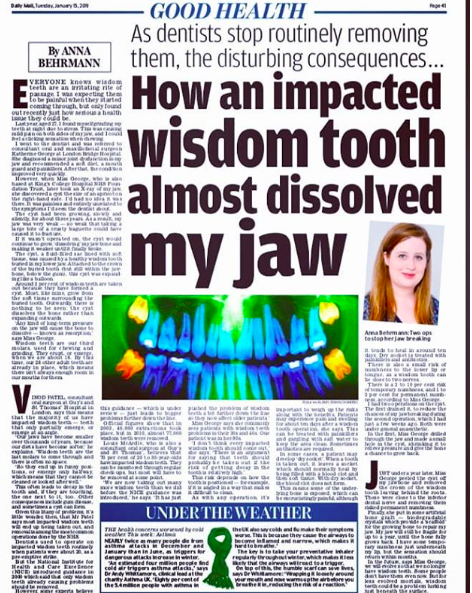 Given this litany of problems, it’s little wonder, then, that Mr Patel says most impacted wisdom teeth will end up being taken out, and removal is among the most common operations done by the NHS. Dentists used to operate on impacted wisdom teeth routinely when patients were about 20, as a pre-emptive strike. But the National Institute for Health and Care Excellence (NICE) introduced guidance in 2000 which said that only wisdom teeth already causing problems should be removed. However, some experts believe this guidance — which is under review — just leads to bigger problems further down the line. Official figures show that in 2003, 40,000 extractions took place, but in 2010, almost 77,000 wisdom teeth were removed. Louis McArdle, who is also a consultant oral surgeon at Guy’s and St Thomas’, believes that 70 per cent of 20 to 30-year-olds have impacted wisdom teeth. They can be monitored through regular check-ups, but most will have to be removed at some point. Miss George says she commonly sees patients with wisdom teeth problems in their 30s and 40s. One patient was in her 80s. This risk depends on how the tooth is positioned — for example, if it is angled in a way that makes it difficult to clean. As with any operation, it’s important to weigh up the risks along with the benefits. Patients may experience pain and swelling for about ten days after a wisdom tooth operation, she says. This can be treated with painkillers and gargling with salt water to keep the area clean. Sometimes antibiotics are required. In some cases, a patient may develop ‘dry socket’. When a tooth is taken out, it leaves a socket which should normally heal by being filled with a blood clot and then soft tissue. With dry socket, the blood clot does not form. This means some of the under-lying bone is exposed, which can be excruciatingly painful, although it tends to heal in around ten days. Dry socket is treated with painkillers and antibiotics. There is also a small risk of numbness to the lower lip or tongue, as a wisdom tooth can lie close to two nerves. There is a 2 to 10 per cent risk of temporary numbness, and 1 to 2 per cent for permanent numbness, according to Miss George. I had two operations on the cyst. The first drained it, to reduce the chances of my jaw breaking during the second operation, which I had just a few weeks ago. Both were under general anaesthetic. In the first, Miss George drilled through the jaw and made a small hole in the cyst, shrinking it to relieve pressure and give the bone a chance to grow back. Just under a year later, Miss George peeled the cyst off my jawbone and removed the crown of the wisdom tooth leaving behind the roots. These were close to the inferior dental nerve and removing them risked permanent numbness. Finally, she put in some artificial bone graft — biodegradable crystals which provide a ‘scaffold’ for the growing bone to repair my jaw. My jaw will still be fragile for up to a year, until the bone fully grows back. I have some temporary numbness just underneath my lip, but the sensation should return within months. In the future, says Miss George, we will evolve so that we no longer have wisdom teeth. Some people don’t have them even now. But for less evolved mortals, wisdom teeth could be a problem lurking just beneath the surface.